Water is a liquid which can be infinitely extracted from water tiles using an offshore pump. After being pumped out and distributed via pipes, water can be used to generate electricity by converting it to steam via boilers or heat exchangers. The specific heat of water is 200J / 1°C x unit. It takes 200 joules to heat one unit of water by one degree Celsius. Shallow water can appear alongside (or in place of) normal water, which can be walked on, but buildings can't be built in it, and will reduce the player's walking speed. The speed reduction does not effect vehicles or enemies. Shallow water appears as one of two shades of blue lighter than that of standard water, with the mildly lighter blue and moderately lighter blue reducing the player's walking speed by 30% or 20% respectively. Water tiles can be removed completely by placing landfill over them. Raw fish can spawn in water tiles, but not shallow ones. The player standing in shallow water. 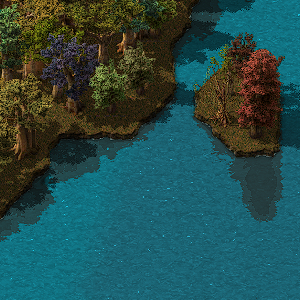 Added two levels of shallow water tiles (only placed by map editor, not generated). Enemies and vehicles can travel over shallow water. Water is generated as large lakes instead of swamps. Better controls in the map generator GUI for water, tiles and cliffs. Landfill can be used to replace water with grass. Water settings in map generation have more effect. This page was last edited on 7 March 2019, at 02:52.